The seed of this tune came firstly not from artistic inspiration - "Oh, I must capture this song immediately while the muse flows freely through my ever-sensitive creative soul!!" - Oh no, my friends. There's a song that I really like by Christ Stapleton called, "Whisky and Me". I decided one day to take the form of the song, rhyme scheme, etc and just write something in the same pattern. As an exercise and a way to "jump start" the writing process. First thing I did was search for a title with the same syllables as "whisky and me" from list of title ideas I'm constantly adding to. I decided on "My Happy Place". I then flipped the sentiment - the former song was sad, mine would be happy. "Fridge is humming" ?- We have an older fridge thta keeps chuggin along! "Browning onions smell like heaven in a pan"? True story. Love it. "That Christmas present that never made it out the door"? There it was, over to my right. "Puppy paws" - 2 dogs, 8 paws in the household! In many songs, the "hook" comes right at the beginning of the chorus. I let "My Happy Place" close out every verse. The stuff about Disney and New York City in the bridge? That's me. My happy places. But the bridge closes out with very best kind of "happy place"
And of course, the ultimate "happy place" in Verse 3. It was suggested in a songwriting critique session to rewrite the bridge. But I left it as is to move to another song. Someone else may not want to recorded it, but it has a whole not of "me" in it, so I figured I'd keep it for myself. There you have it! A song that might never have been born that day if I hadn't practiced a little pro-writer discipline and shown up to the solo "writing session"! Check out the photo below. I was surprised to be reminded in my scribblings that "My Happy Place" started at the beach but ended up in the living room! I love songwriting! How about you? Going back to my previous post about my morning routine when I'm home. Sort of my public declaration of professional and artistic progress, I guess. Ha ha. I opened up a song early this morning that I'm currently writing with a new friend and co-writer. There was a line that I thought could just be stronger; like it was there just to rhyme. Just spending a short time on it and coming up with something usable, or at least a new direction we can take the lyric, sets up the rest of the day. Even if it's filled with some non-musical tasks. I wrote today! I made progress today! Hallelujah! Can't wait to share it. I’ve changed home my morning routine a bit (at least at home) that has been a little more fruitful in the songwriting department. It’s real easy to sit back, sipping coffee, relax, and read whatever in the early hours, then get to the real work. After opening my Bible app to the living words therein for a spiritual realignment, instead of letting emails and social media fill my head with all kinds of stuff (not all bad but still “stuff”) during my second cup of coffee, I get out my yellow legal pad and just start writing – anything. Without an expectation of how good it’s going to be. I’ve got a assorted lists on paper and on just about every electronic device I own full of song titles, one line descriptions of “life scenes”, paragraphs, newspaper articles, the list goes on. I just pick one idea and start writing something underneath it, even if it’s bad. And most times I get something I can build upon in the coming mornings or whenever it’s lyric writing time. After my morning idea brainstorming, I continue on to a physical workout of some sort. As an embryo of a lyric formed, when I got to scribblings for the second part of the verse – What rhymes with Santa Anas? Well…Pollyanna. Okay, this is getting interesting I think to myself. What ends up happening, a place, a story, etc appears, and then it seems I have a lyric slowly being wrapped inside a melody. Then the second part of the verse with the word “Pollyanna” in it develops a life all it’s own and seems better now as the chorus; the hook of the song. And there’s my song title: “Pollyanna”. And off I go to Wikipedia for "Pollyanna" references. The thing about these songwriting exercises as I’ve described above is, for me, building the discipline to sit down and just write without expectations opens up my eyes, my ears, and my heart to life around me as I go about my day. I feel I could write a song of just about anything or at the very least, write down one line to use later. It almost becomes a welcome “sickness”. I’m a words hoarder! If you're a "tweeter", feel free to follow me HERE. 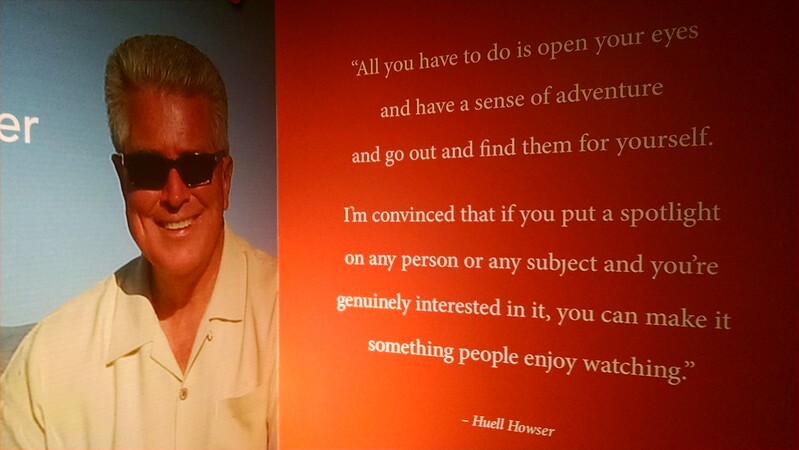 PBS TV host, Huell Howser was known and loved by many Californians as well as myself. You could watch his slow-paced, down-home, totally family-friendly program and suddenly all was right with the world. He passed away sadly in 2013, so this past Summer I went to visit his archives all donated by Huell himself to Chapman University in Orange, California. Loved it. Many of the quotes about his creative process, how he found his stories to present - spoke to me about songwriting as well. Feel free to scroll through the photos. Along with many musical types, he's right up there on the creative inspiration scale for me personally.